Prints are sold on a white mat and on a high quality black wood frame. The photo itself is printed on Kodak ENDURA Metallic paper which has a glossy finish and metallic appearance that create images with exceptional visual interest and depth, delivering rich, vibrant colors. An acrylic sheet is also added to protect the front of your framed print. 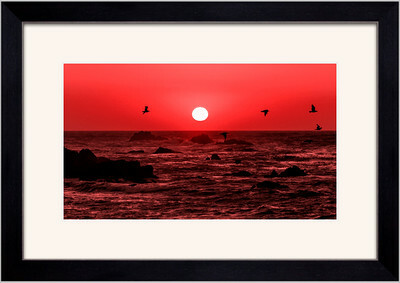 This is a high-quality clear acrylic that is indistinguishable from glass when the framed print is hung on the wall. All framed prints are finished with paper backing and wire hangers. Fully assembled, your framed print will be all the more dramatic and rich, making it a product you'll be proud to display on your wall.